For Marriage Equity: Why Is This Year Different From All Other Years? Each spring, I join with observers around the world to retell an ancient tale and pose a number of questions. (No, it's not the story of the Flyers Stanley Cup drought and the questions about finding a cup-winning goalie.) We tell the story of the biblical exodus of the Israelites from Egypt and read the Passover Haggadah -- wondering why this night is different from all other night and singing songs and prayers of gratitude. The lessons we learn and relearn each year are much on my mind as we approach the coming Primary Election. Each year, I attend two Passover Seders, the ritual meals that stage the retelling of the story. With my in-laws, we read and chant the text from start to finish in Hebrew over hours of reading and noshing. It is incredibly moving to participate just as countless multitudes have done over generations. My Hebrew is not so strong, so I also appreciate my other Seder, where I join with my family in reading a condensed and mostly English version of the Hagaddah. 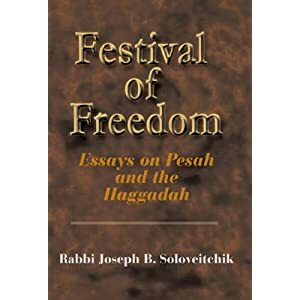 We read a Hagaddah first published in 1958 which weaves the story of the Israeli exodus into a tale of the merits of democracy and the promise of America. It is preachy and campy, but meaningful in the way it captures the post-war enthusiasm that liberty and justice might just triumph. The struggle for freedom is a continuous struggle, for never does man reach total liberty and opportunity. In every age, some new freedom is won and established, adding to the advancement of human happiness and security. Yet, each age uncovers a formerly unrecognized servitude, requiring new liberation to set man's soul free. In every age, the concept of freedom grows broader, widening the horizons for finer and nobler living. Each generation is duty-bound to contribute to this growth, else mankind's ideals become stagnant and stationary. The events in Egypt were but the beginning of a force in history which will forever continue. In this spirit, we see ourselves as participants in the Exodus, for we must dedicate our energies to the cause there begun. As I read those words this year, I reflected on their meaning about new liberation and the advancement of human happiness and security. I cannot read those words without considering a major civil-rights cause of our generation. Today, in the Commonwealth of Pennsylvania and elsewhere across the nation, certain citizens do not have the right to marry whom they choose. If this is not part of the concept of freedom growing broader, I do not know what is. Like, well, everyone, I count members of the LGBT community among my family and my friends. I read the words of my Hagaddah and see uncovered and formerly unrecognized servitude, requiring new liberation. The push for marriage equity can take a major step forward this year as Philadelphians have the ability to send the first open members of the LGBT community to Harrisburg to represent us in the General Assembly. Brian Sims, a gay candidate for State Representative in Center City (182nd District) and Fatima Muhammad, a bi-sexual candidate for State Representative in University City (188th District), can fundamentally change the conversation on marriage equity and other important rights issues. Of course, they both happen to be intelligent, passionate, credentialed, and energetic candidates as well. Looking around at other states that have adopted gay-marriage measures, a key factor in advancing the debate has been the presence of "out" members of the legislature to lead the push from inside the legislature itself. To our north, New York enacted gay marriage in 2011, to our south, Maryland followed in 2012. With no acknowledged members of the LGBT community in the Pennsylvania General Assembly, the movement toward gay marriage in Pennsylvania is going nowhere. This is our generation's new freedom to be won and established, adding to the advancement of human happiness and security. I sincerely hope that when I gather to tell the Passover story with my family next year, we can say we broadened and widened the horizons for finer and nobler living with our actions this year. Electing out candidates is crucial to that effort. Next year -- in equity!